Bryn Awel. Penmachno. Traditional cottage 4 miles from Betws y Coed. Bryn Awel is a traditional stone-built Welsh cottage with original beams, tiled floors, fire places, sash windows, antique furniture and a log-burner. Situated in the centre of the tranquil village of Penmachno, surrounded by beautiful scenery and only 4 miles from Betws y Coed. An ideal base for exploring all that Snowdonia has to offer. Bryn Awel has been awarded Trip Advisor Certificate of Excellence 2017 and 2018. Parking is free on the street close to the cottage. The cottage is accessed by 3 steps into a small porch and then another step at the front door which leads directly into the sitting room. The sitting room, dining room, kitchen and bathroom are on the ground floor and a back door opens onto a private garden. There is a high step to access the bathroom. Wooden stairs lead to the bedrooms on the first floor. The double bedroom is light and spacious, the twin room is smaller. Both have wooden floors with rugs, pine furniture and original Victorian cast iron fireplaces. Bryn Awel has free Wifi, Sky Freeview TV, a large selection of books and DVDs and a few traditional games. An initial basket of logs for the wood burner and then available to purchase at a number of places in Betws y Coed. We live in Penmachno and are happy to be contacted before and during your stay should you require assistance or local information. We live in Penmachno and enjoy welcoming visitors to this wonderful area. 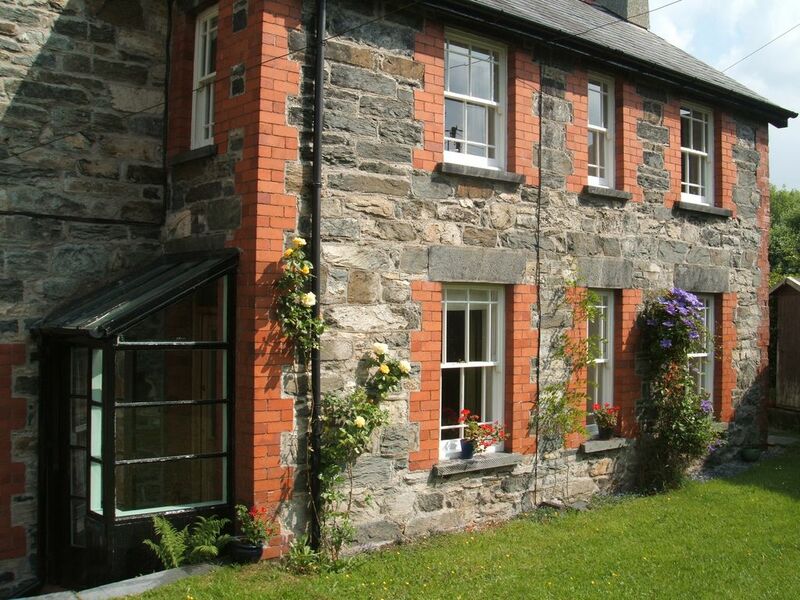 Bryn Awel is a traditional and characterful cottage situated in a quiet village in a beautiful upland valley in the heart of Snowdonia and offering easy access to all of the amazing things that Snowdonia has to offer. On the ground floor with a step to access the room. Electric wall fixed and free standing heaters, in addition to the wood burner! We recommend slippers indoors due to the tiled floors. Parking is on the street, free, close to the cottage. 2 settees, bookcases, TV, log burner. Tea, coffee, sugar, cooking oil, salt and pepper are provided. CDs can be played via the TV. On local interest, history and culture of Wales, Welsh recipes books and a selection of novels. A few Welsh music CDs. Rent och mysigt litet hus i två våningar i vacker omgivning. Ett perfekt boende för den som vill uppleva den Walesiska landsbygden och de underbara omgivningarna kring Snowdonia. Huset ligger mitt i byn vid kyrkan. I byn finns även en pub som serverar mat på helgen. I övrigt måste man handla och ta med sig mat då det inte finns någon affär i byn. Handdukar ingick dock inte men då det inte stod något om detta hade ägaren lagt fram det till oss. Lägg hellre på en pund och låt handdukar ingå. The area has masses of wonderful things to see and do; way too many to list here....but here are some of them! Snowdon, Bodnant, Portmeirion, Betws y Coed, Caernarfon, Harlech, Conwy, Llandudno , Steam railways, museums, ancient castles, fabulous scenery and walks are all within easy reach. The area has many adrenaline sports: 'Go Below', 'Zip World', 'Surf Snowdonia', White Water rafting at Bala, Mountain Biking in Penmacchno and Coed y Brenin. Annual motor sport Forest Rallys. Theatre and cinema in Llandudno. Welsh Male Voice choirs sing in Local pubs and there is a choir festival in Betws y Coed every summer. Antique fairs, art galleries, fabulous restaurants. Swimming pool and health spa in Betws y Coed. Lovely local cafes with fabulous homemade food....3 on the outskirts of the village. Horse riding is available locally too. We are happy to answer any questions you may have about local activities and attractions.